Update: We ended up with 14 inches of rain in 2 days! It’s 3PM and we’ve already had 3 inches of rain dumpped on us today from typhoon Sinlaku. The worst part of the storm isn’t supposed to hit for about 18 more hours so I’m sure we’ll see a lot more rain and wind before it’s over. Right now, gusts are at 130mph and surprisingly we still have electricity, being in the city helps shield us from some of the wind. The typhoon’s not the only drama right now. We had a small earthquake on the south end of the island this morning, but we didn’t feel it. That’s two earthquakes in the last three days. What fun. 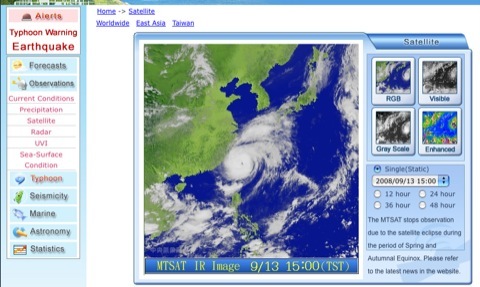 Here’s a screen shot of our the Central Weather Bureau’s website. We are buried below that mass of swirling clouds. Wow, I guess Texas isn’t the only place having a rough go of it these days. Keep dry.